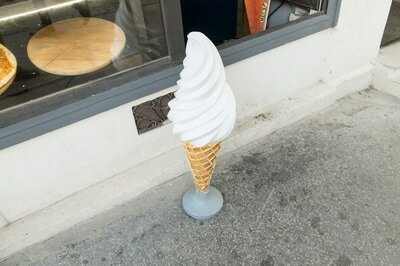 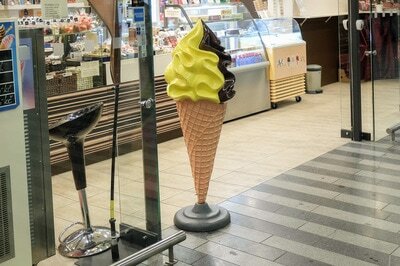 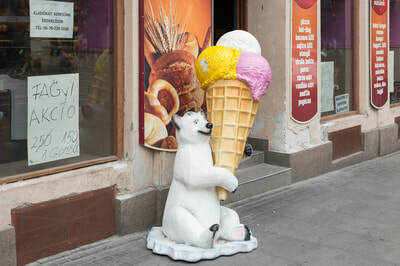 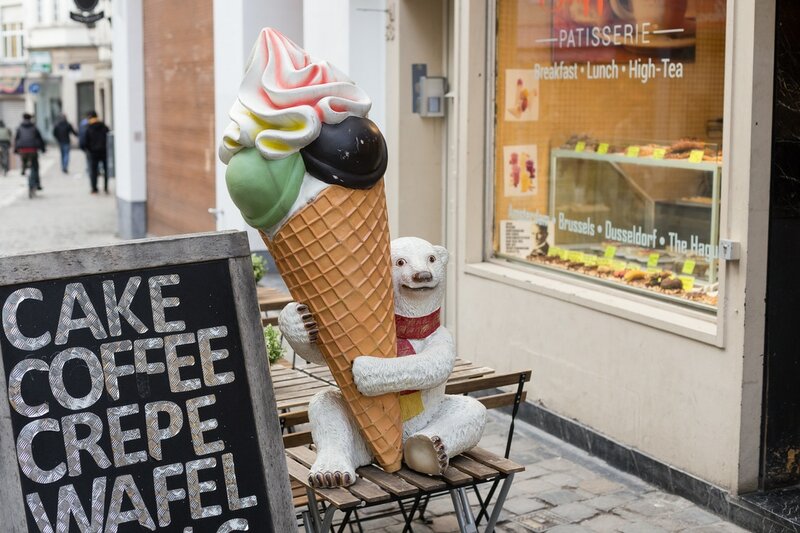 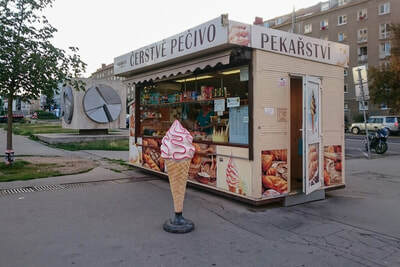 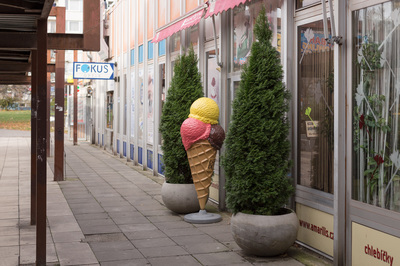 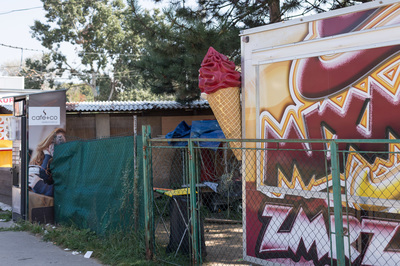 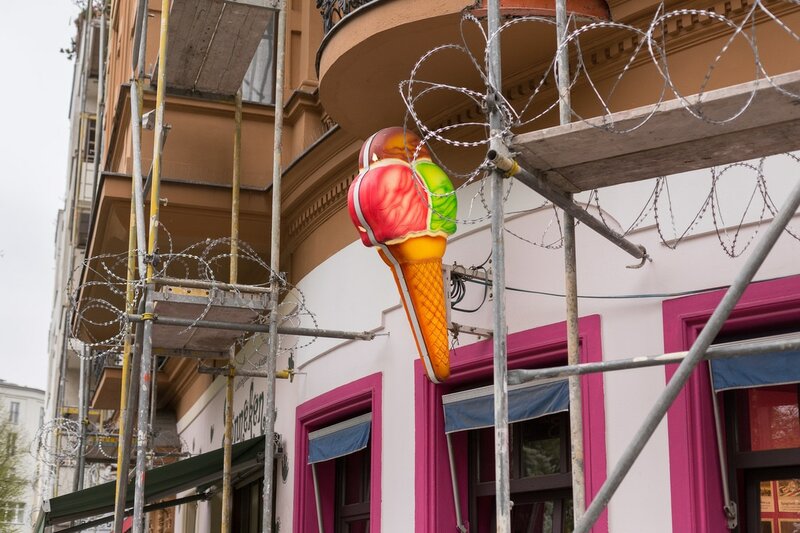 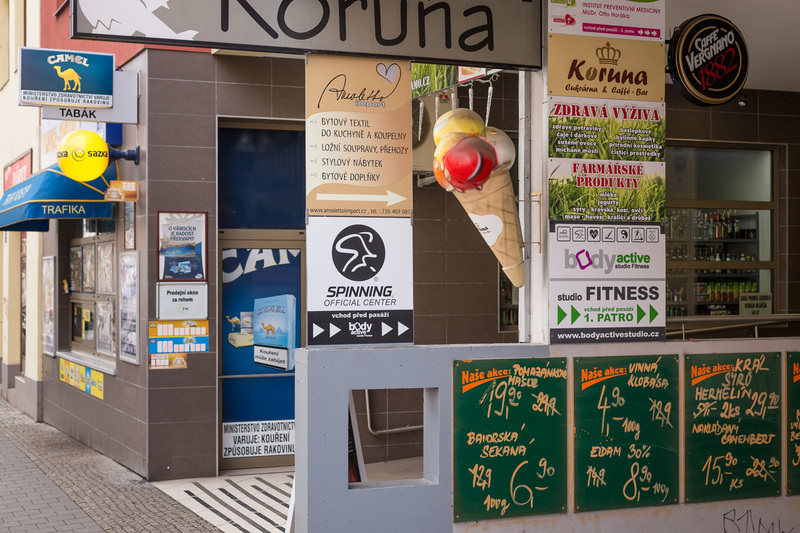 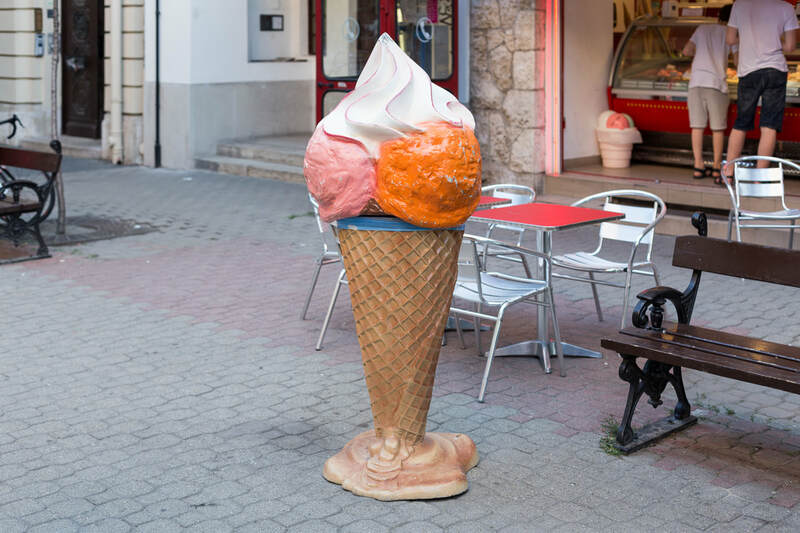 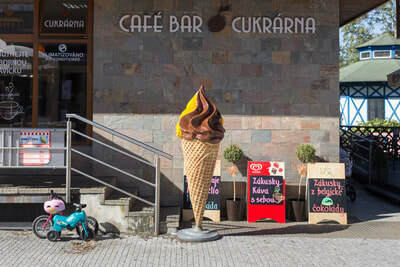 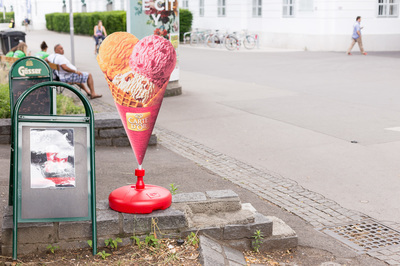 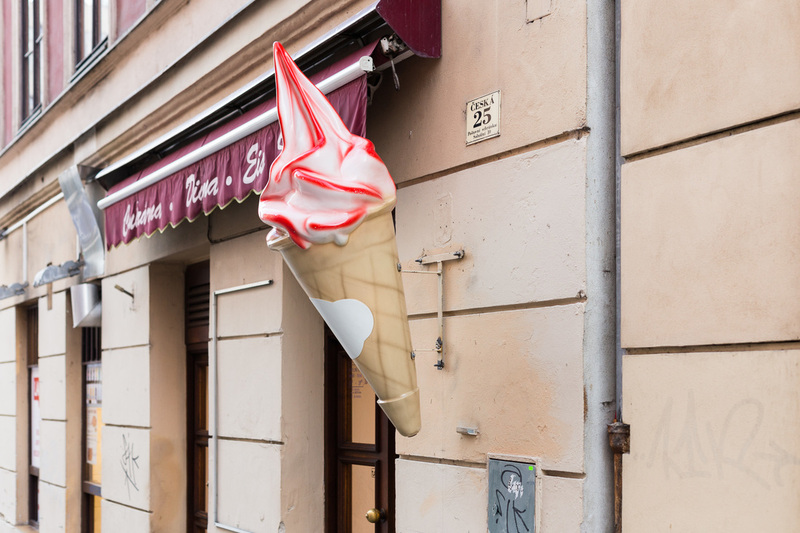 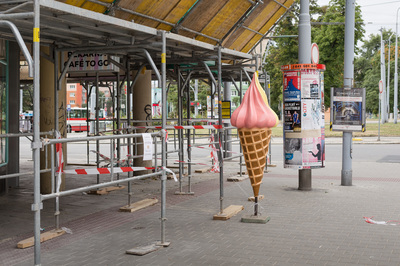 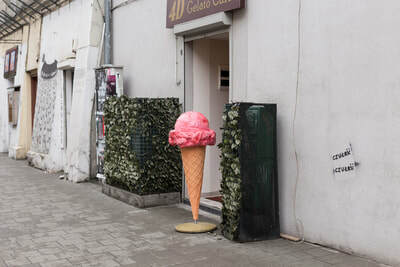 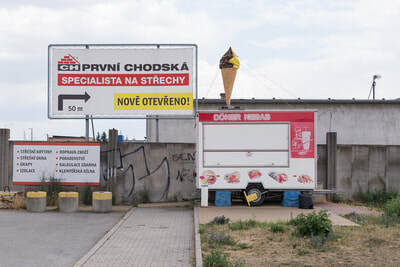 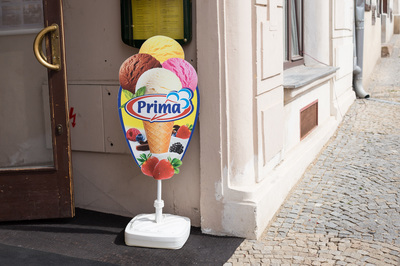 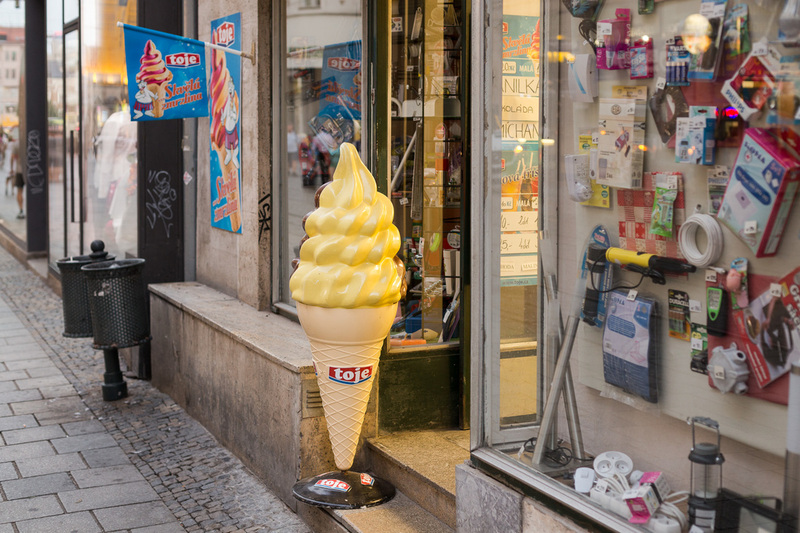 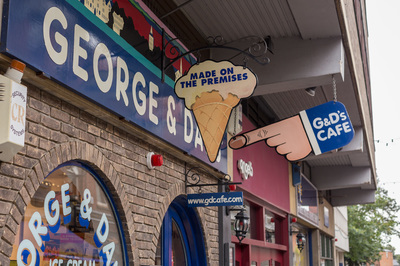 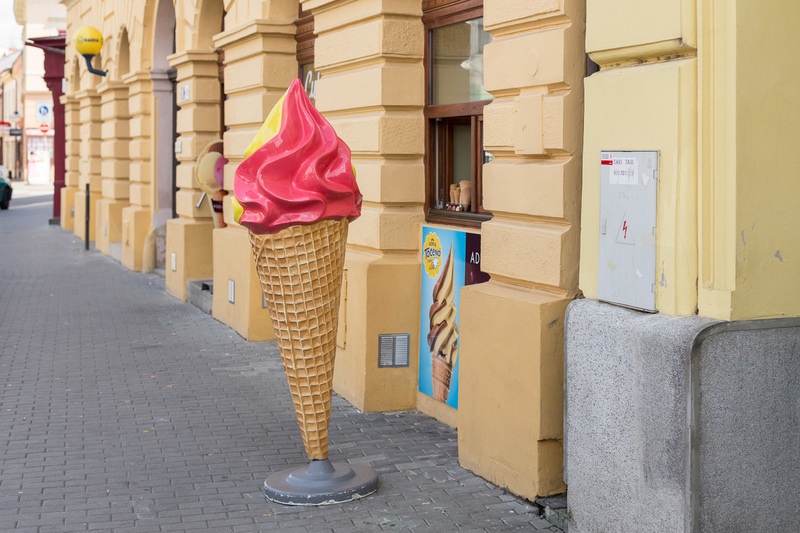 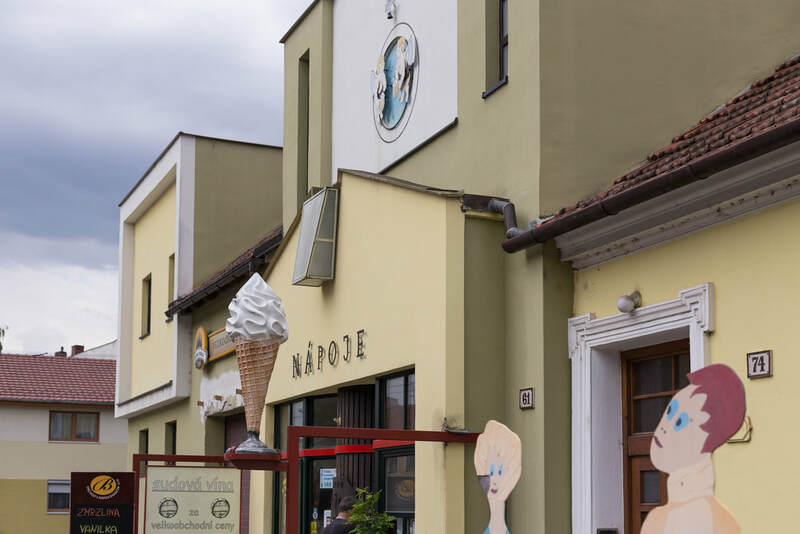 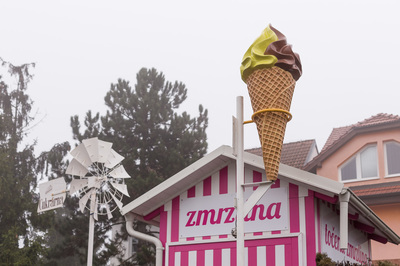 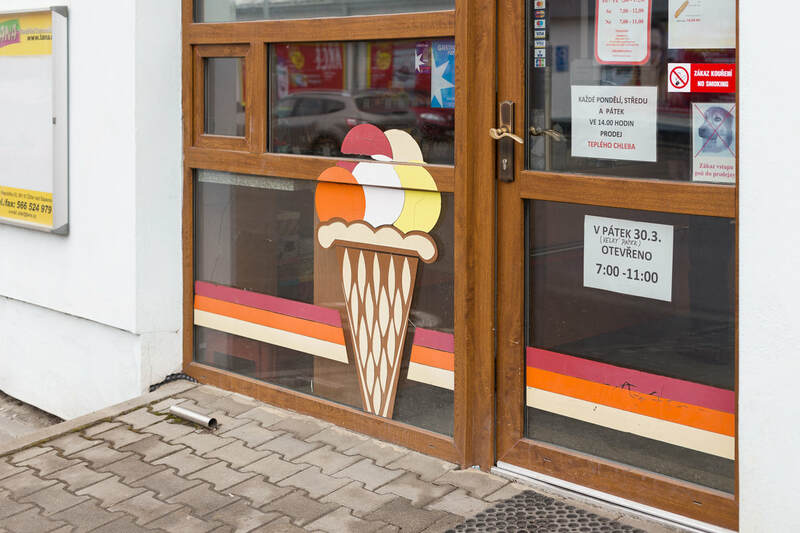 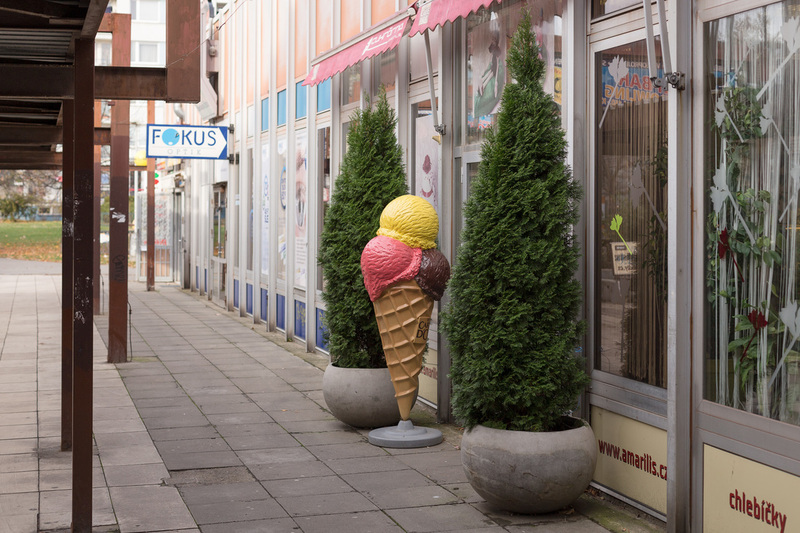 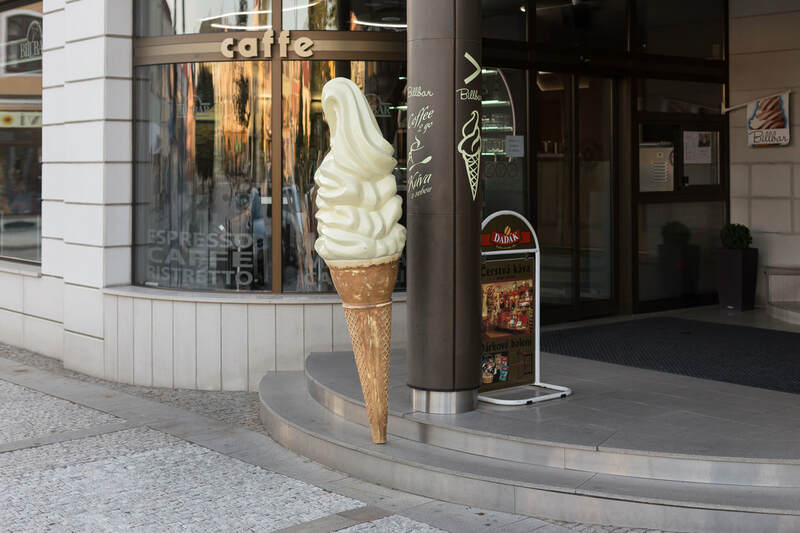 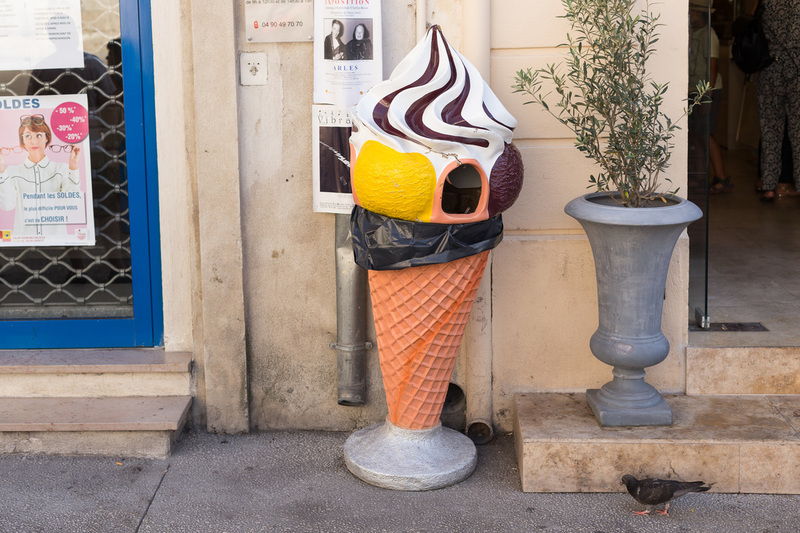 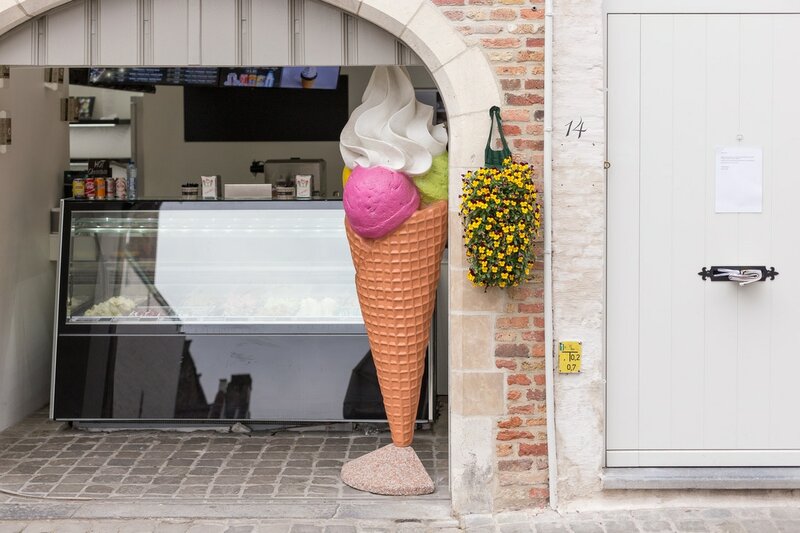 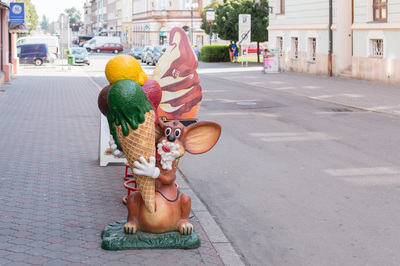 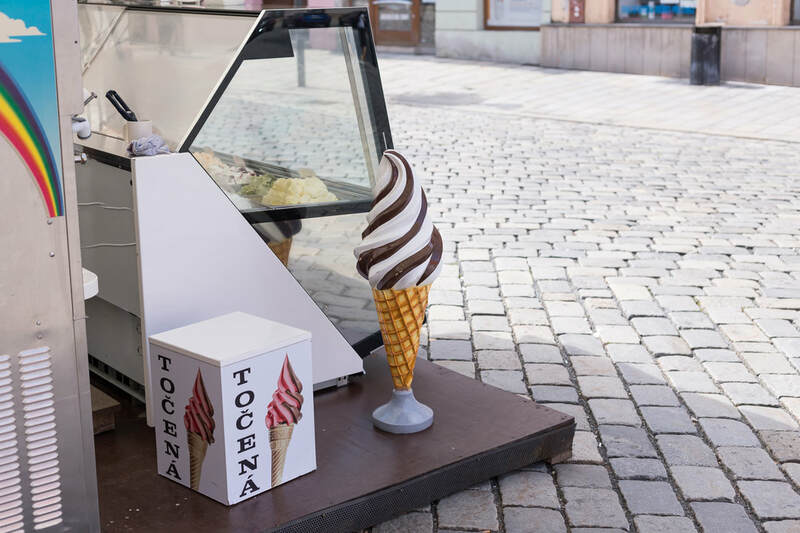 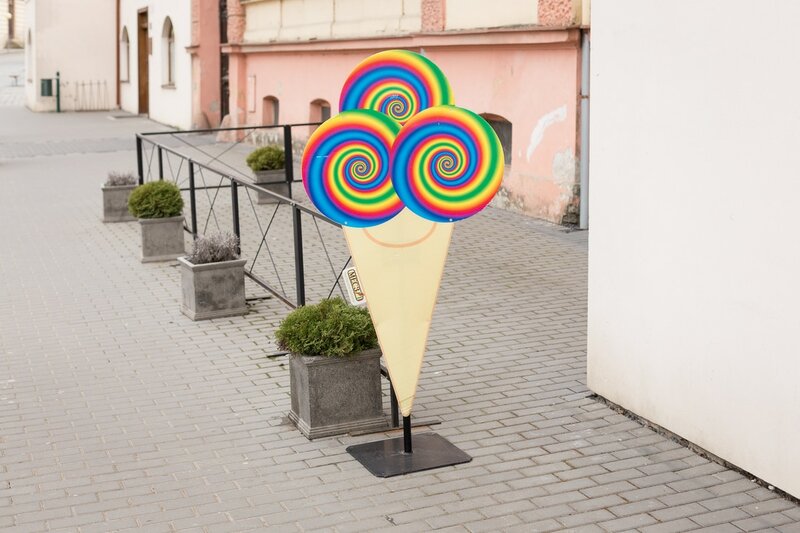 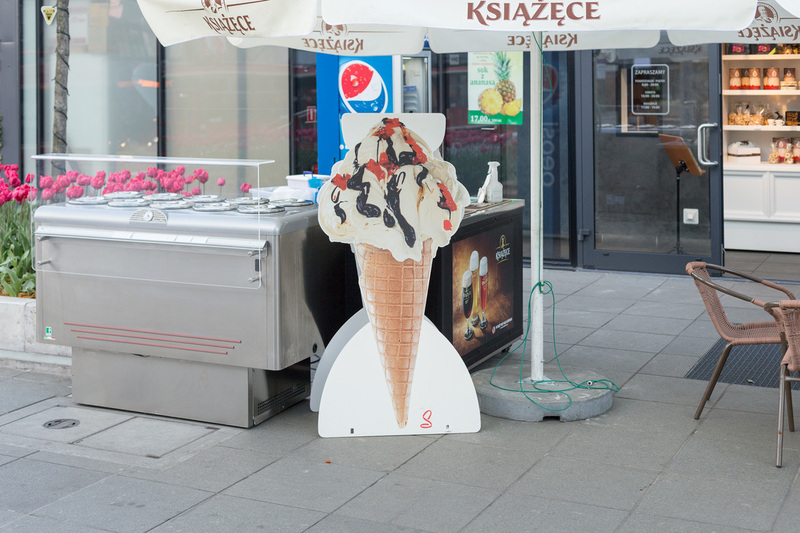 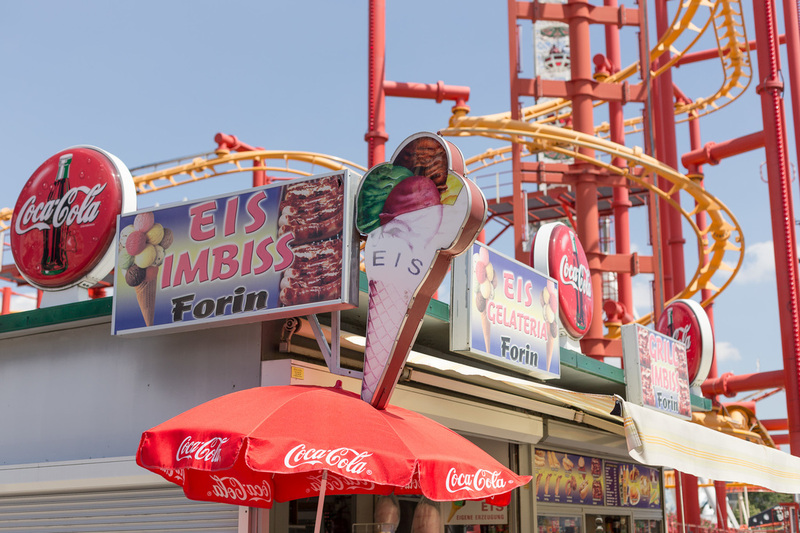 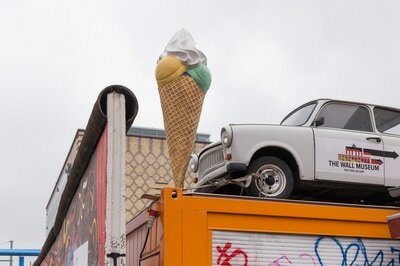 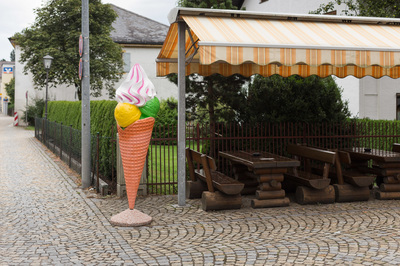 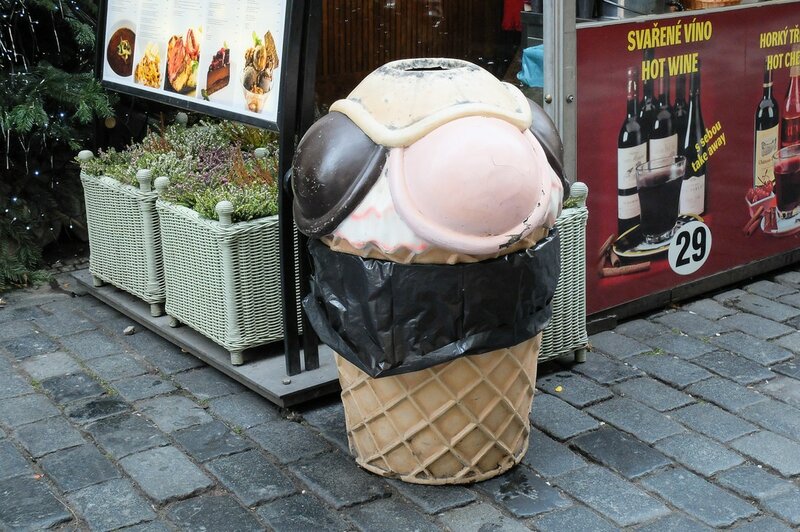 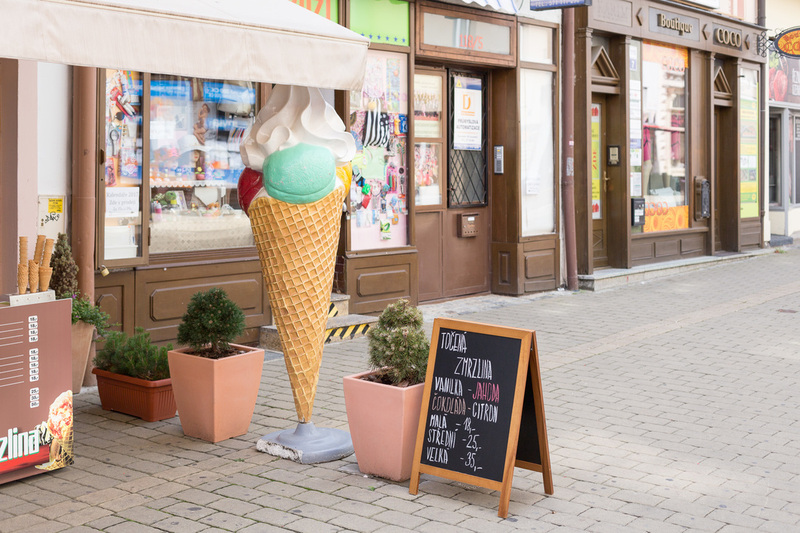 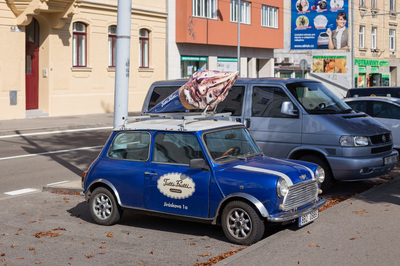 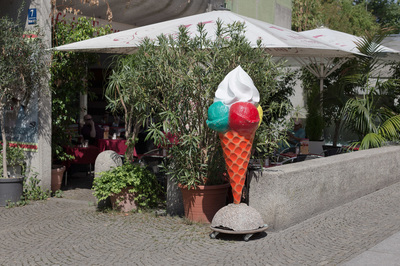 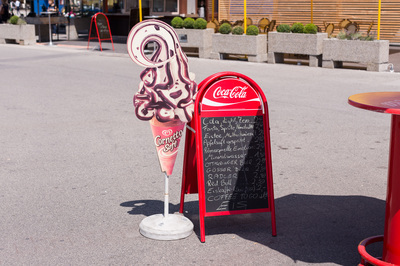 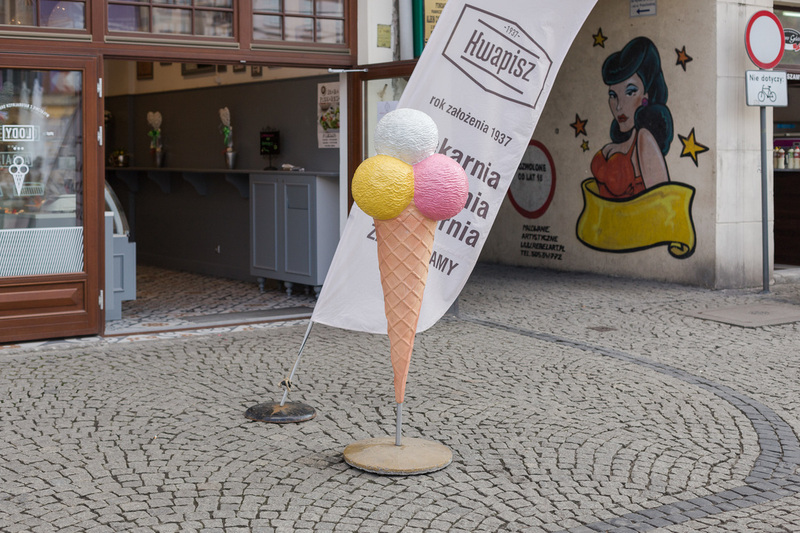 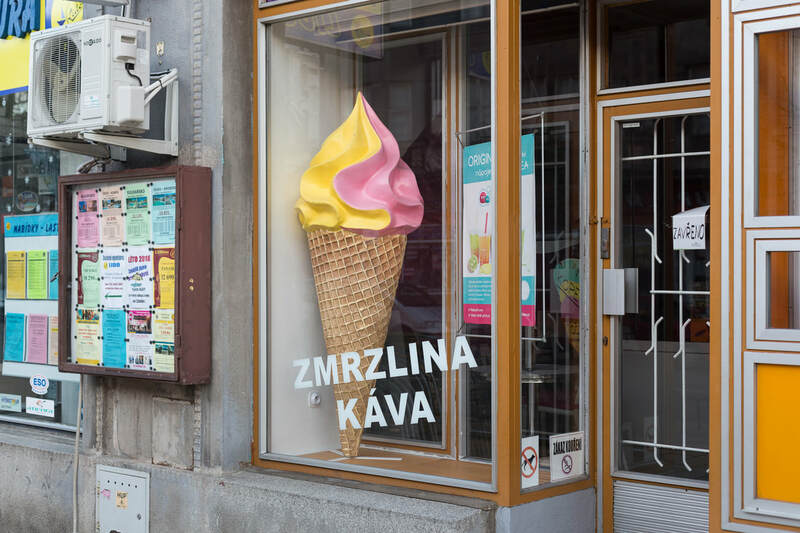 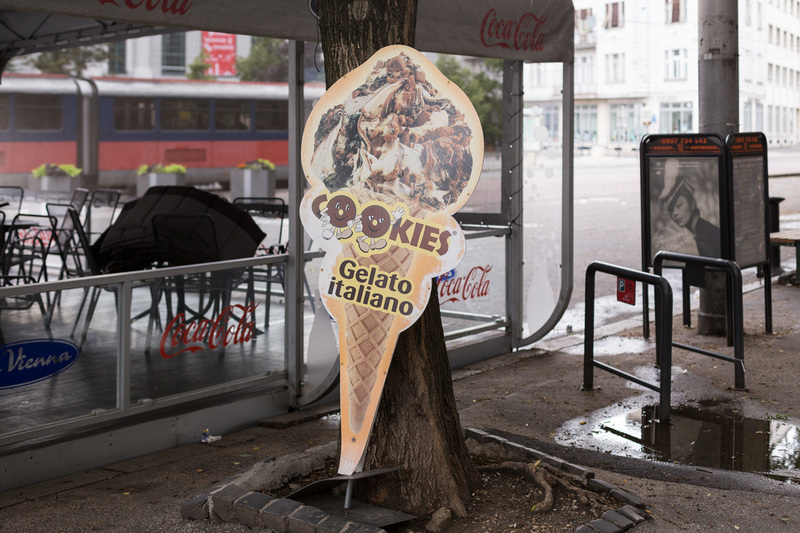 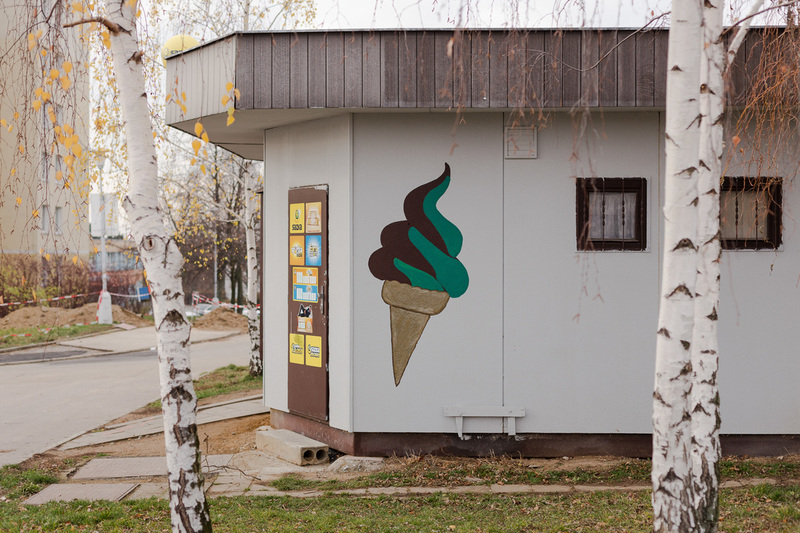 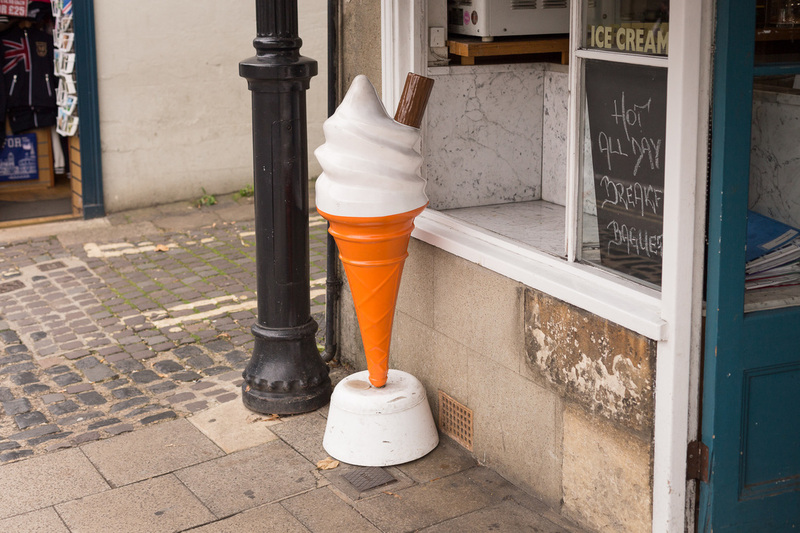 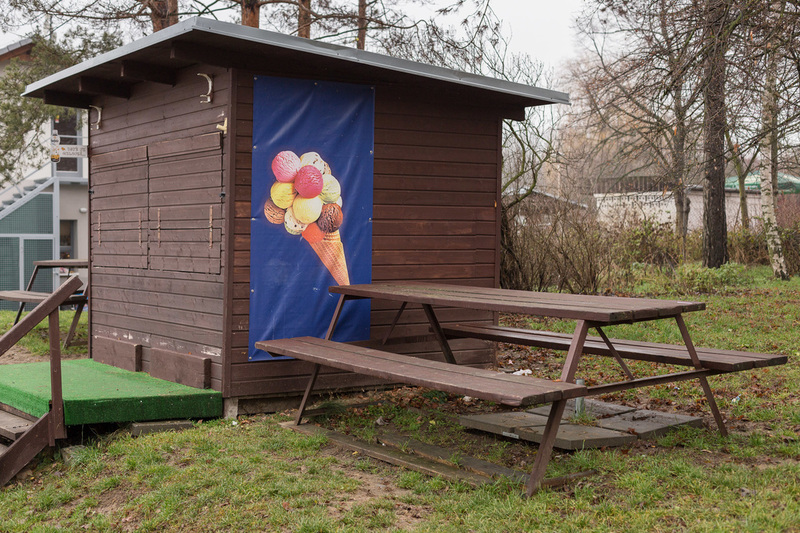 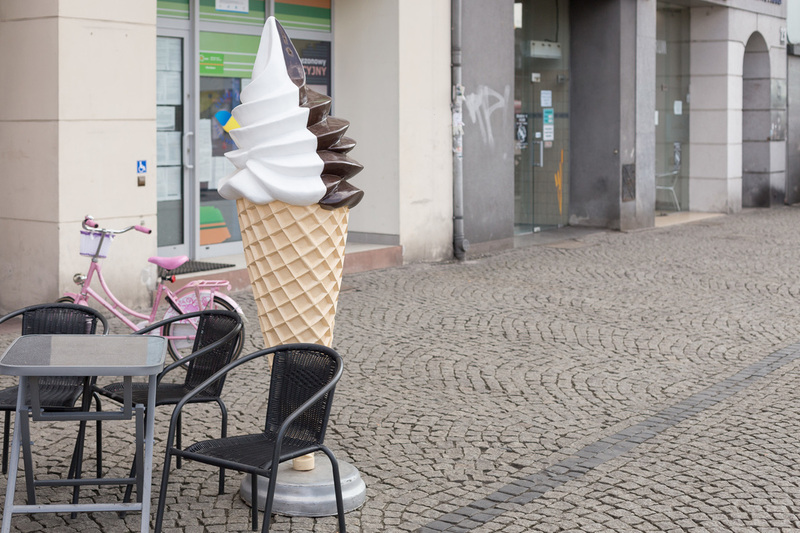 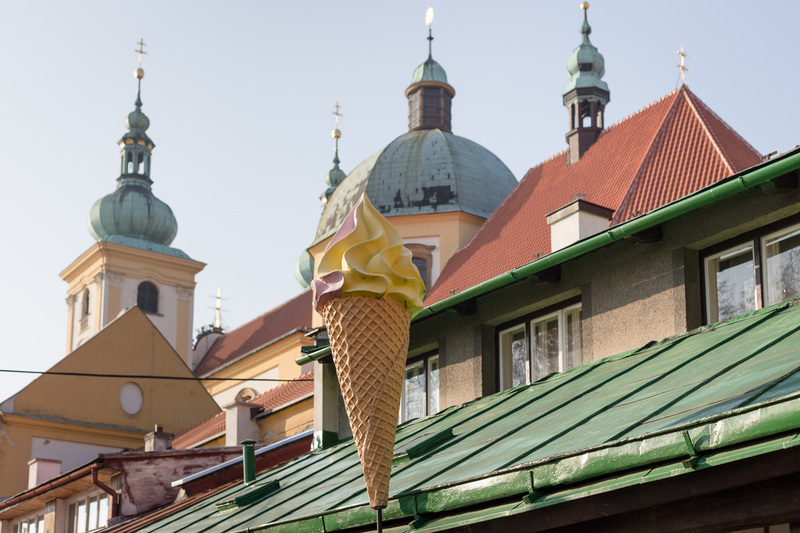 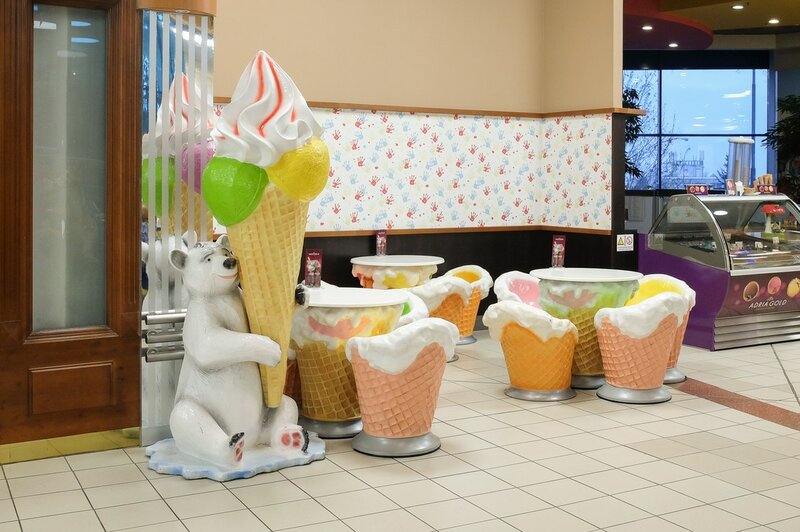 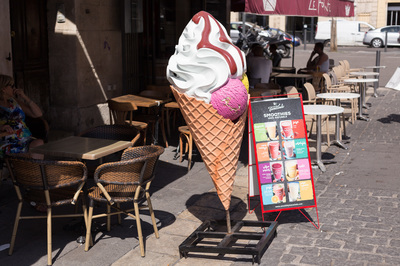 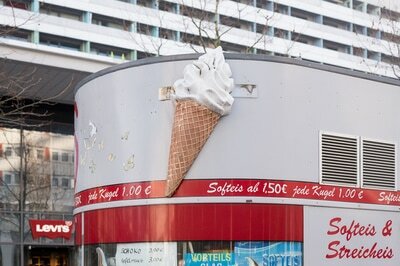 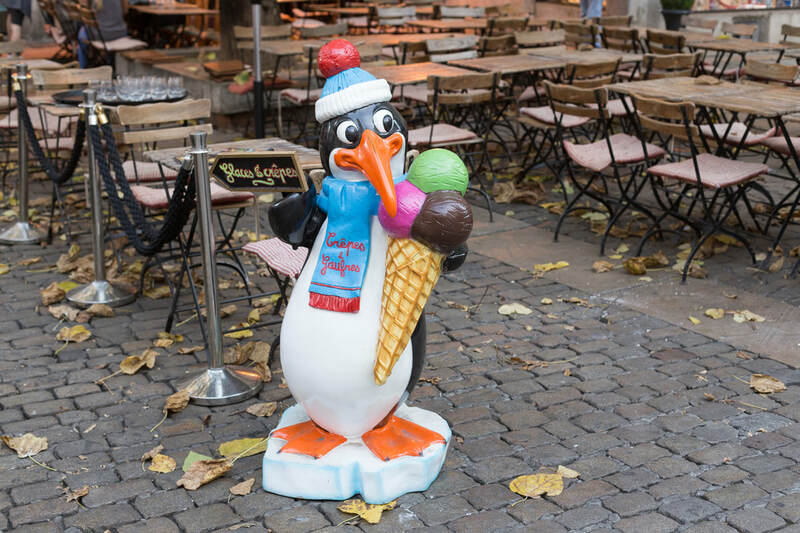 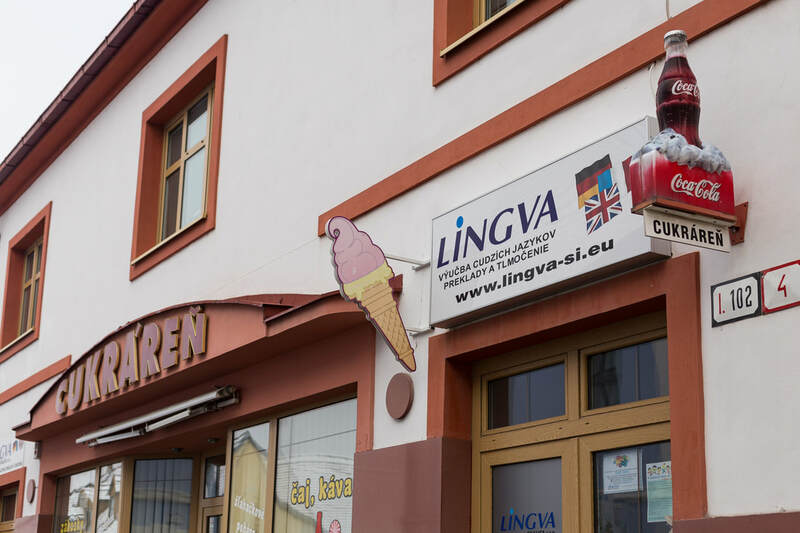 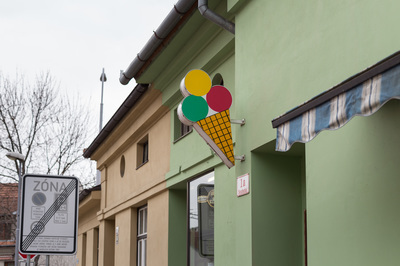 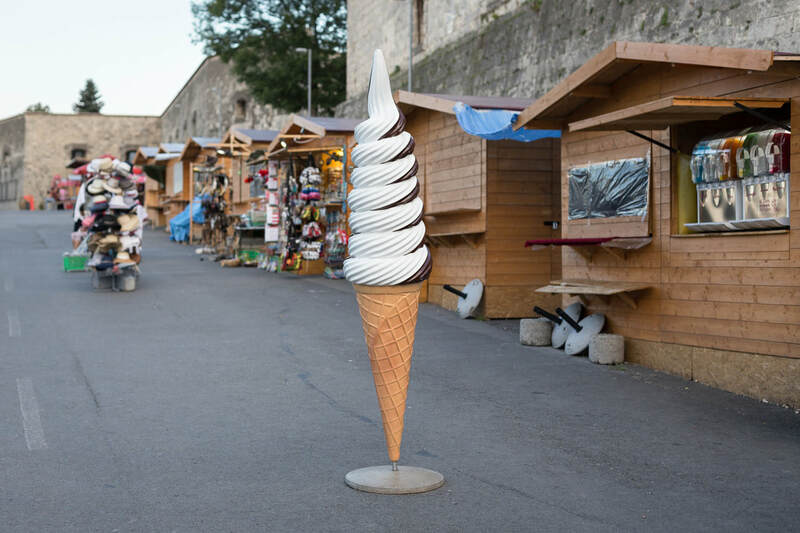 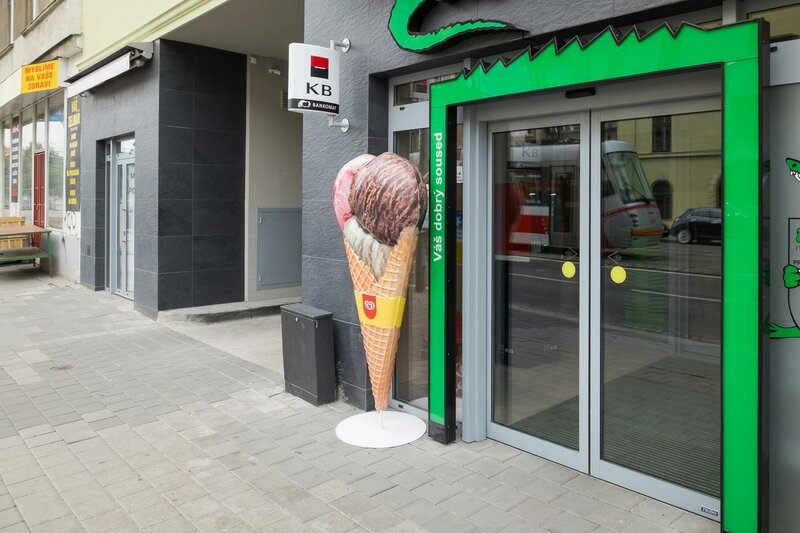 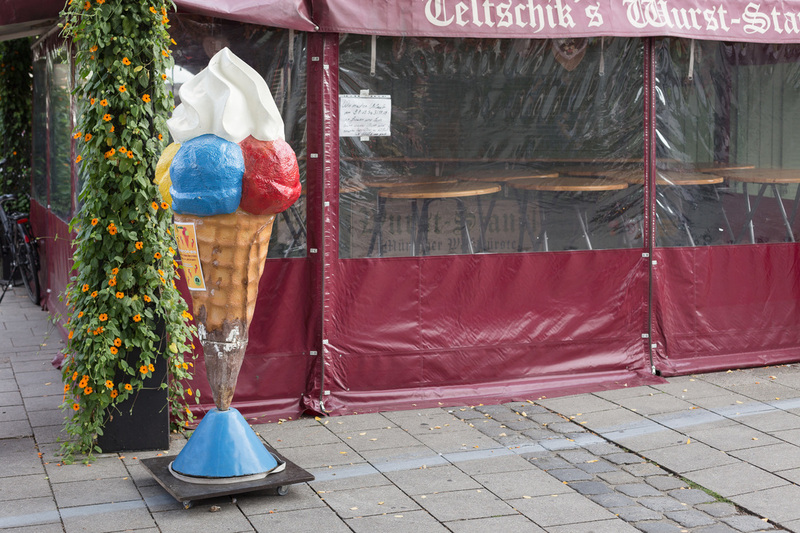 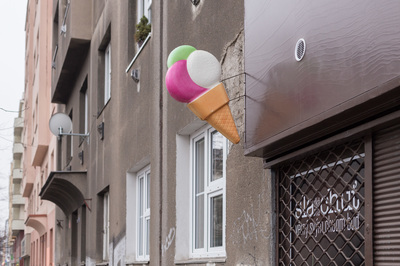 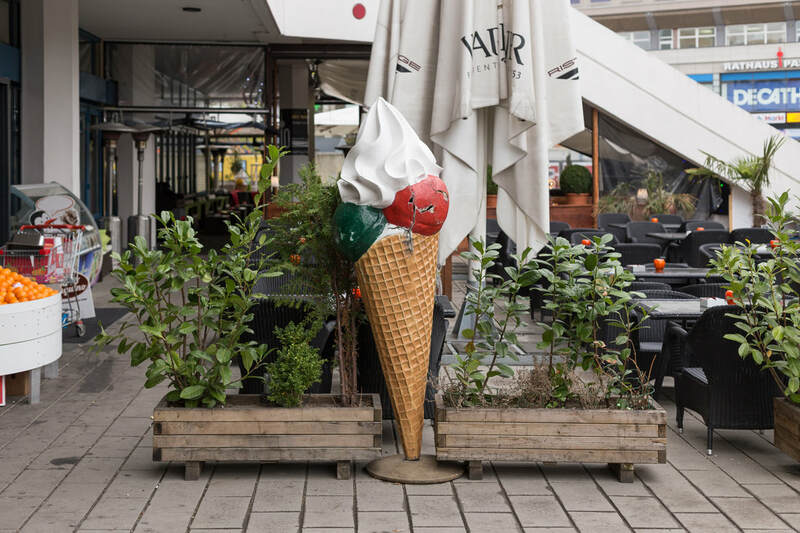 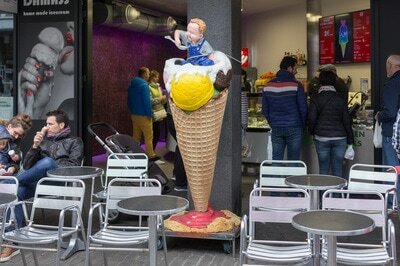 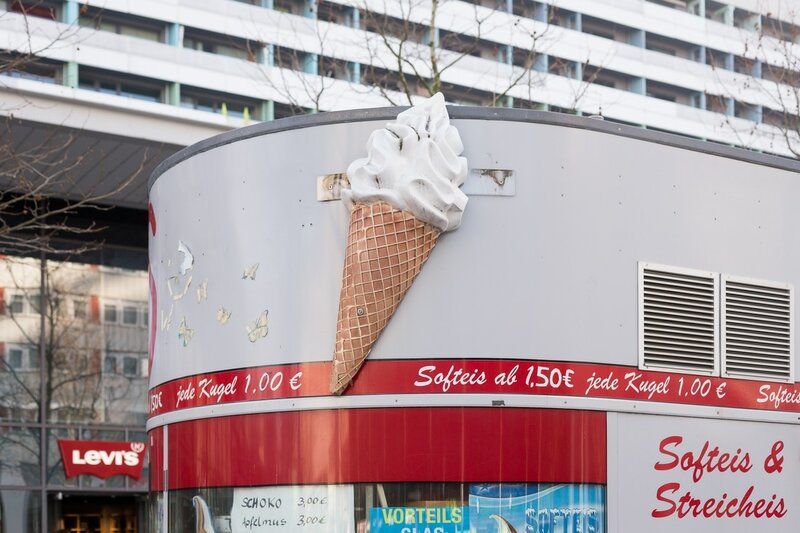 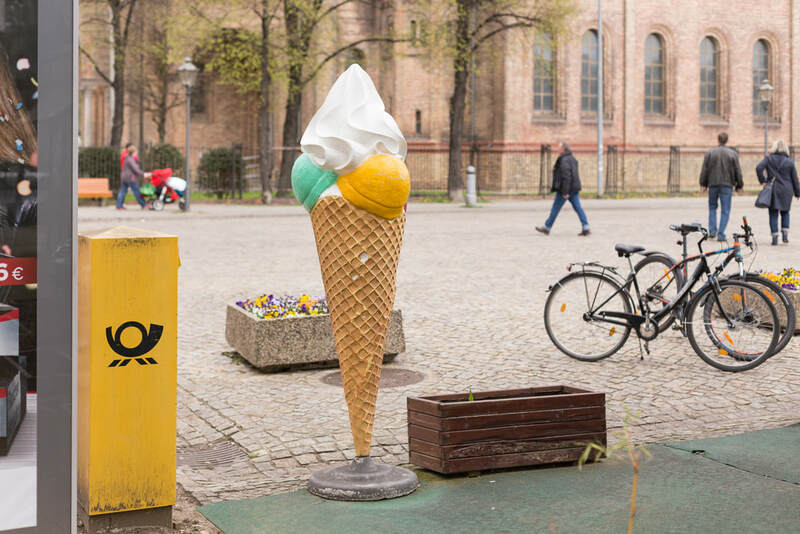 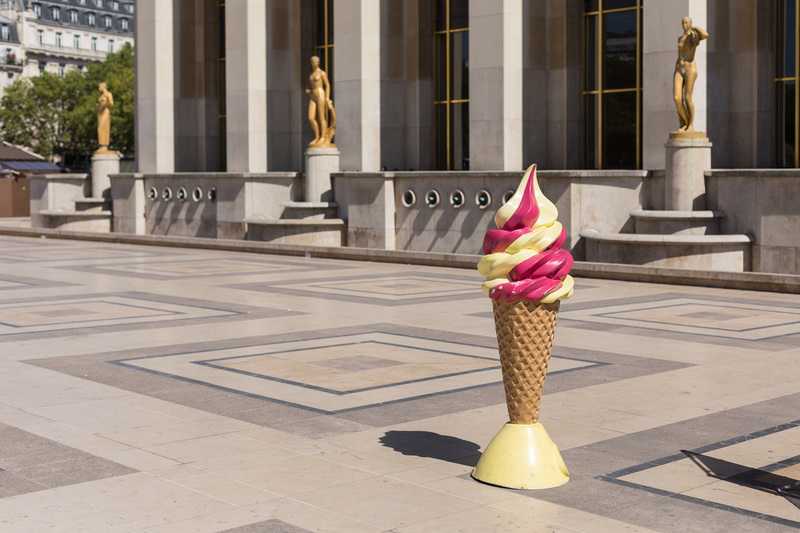 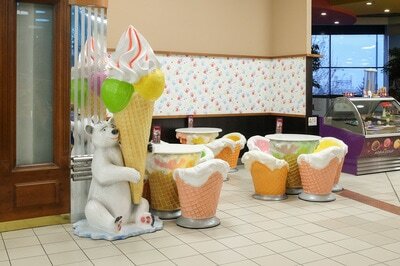 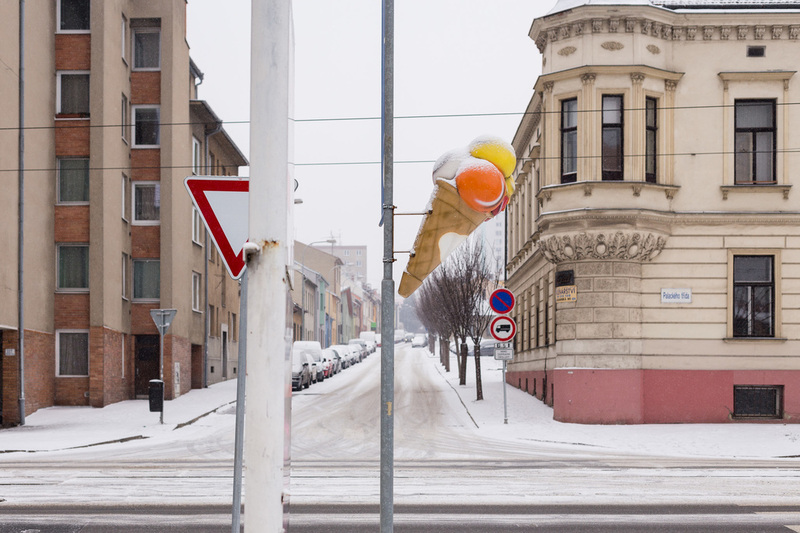 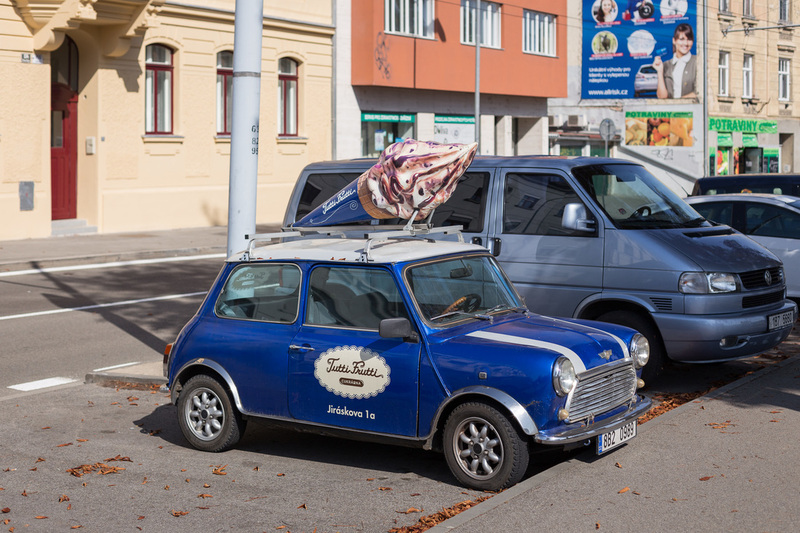 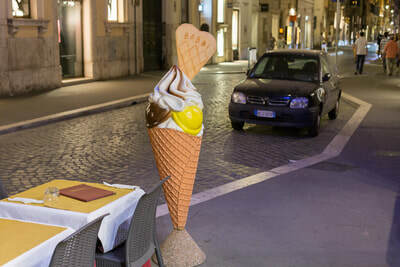 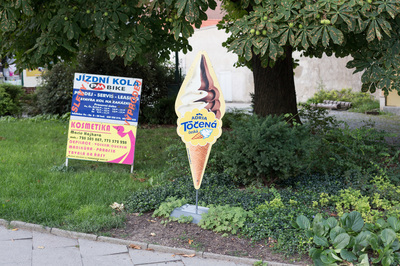 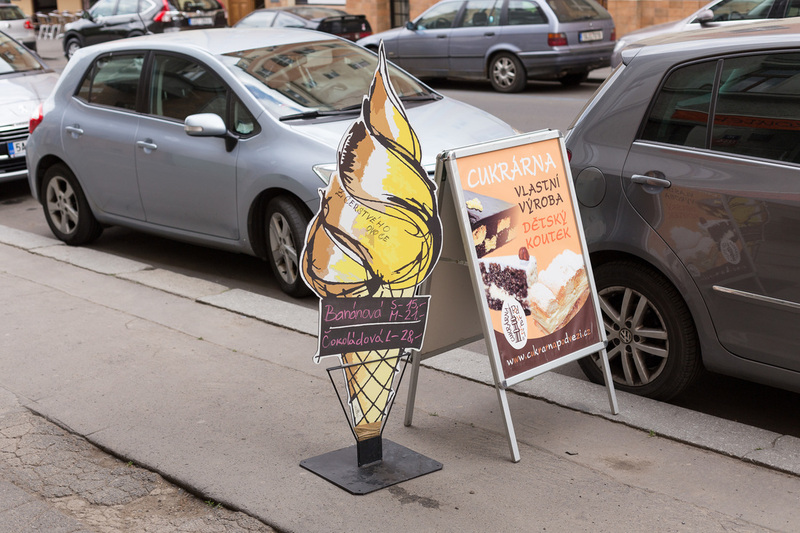 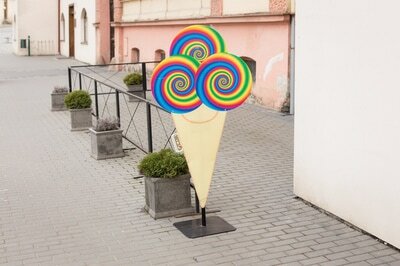 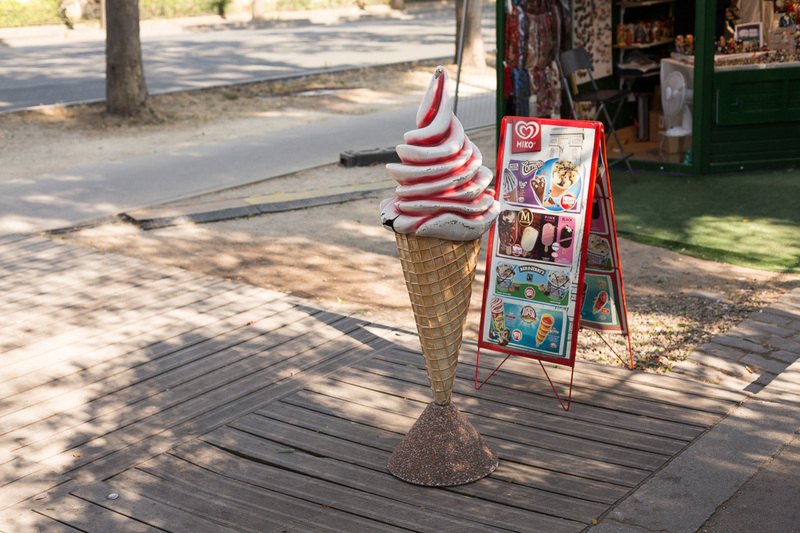 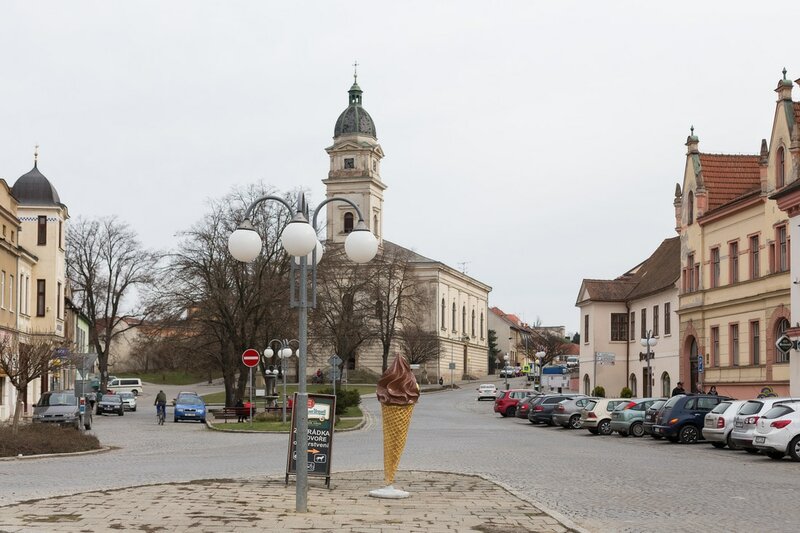 An ongoing rather light-hearted project of photographing large (mostly plastic) ice-cream cones in Czech Republic and countries around. 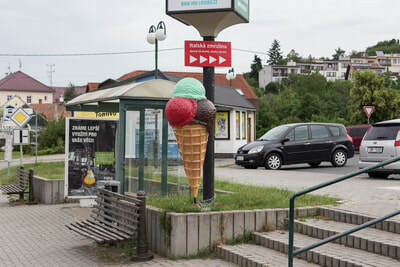 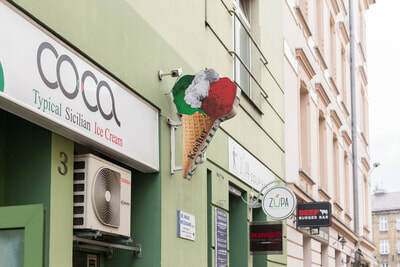 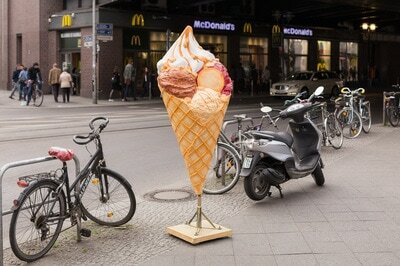 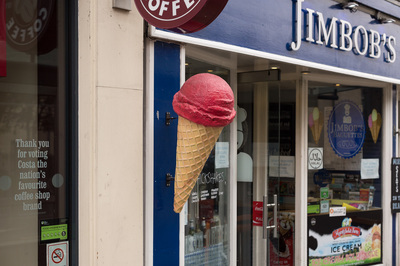 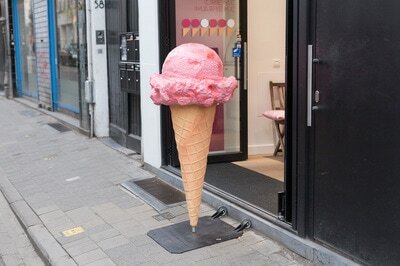 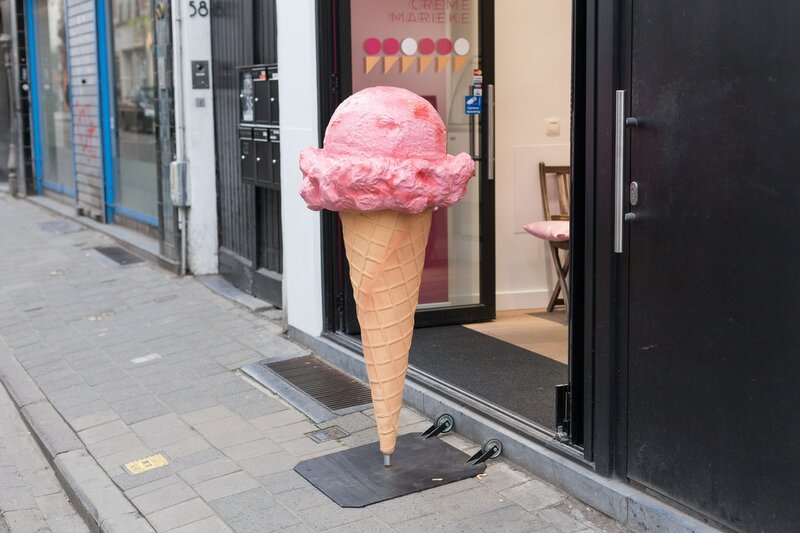 Zmrzlina as work, ('ice-cream' in Czech, pronounced /zmr̩z.lɪ.na/), is not about plastic and cardboard ice-cream cones throughout the Czech Republic, Slovakia, Germany, Poland, Austria, UK, Belgium and France. 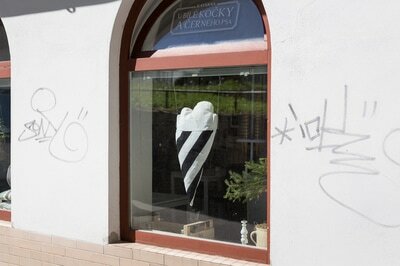 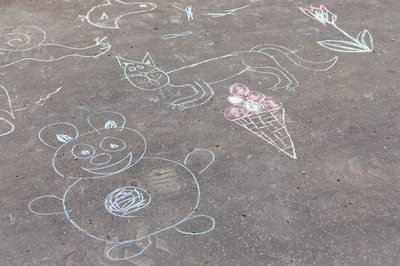 Contextually, the collection of photos can be seen in several ways. 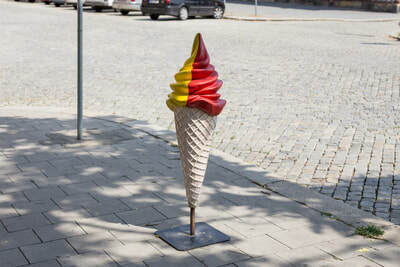 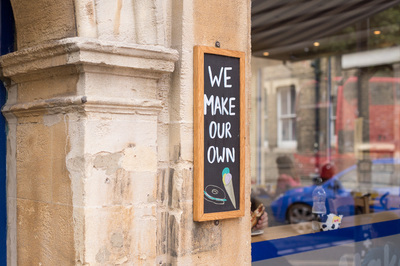 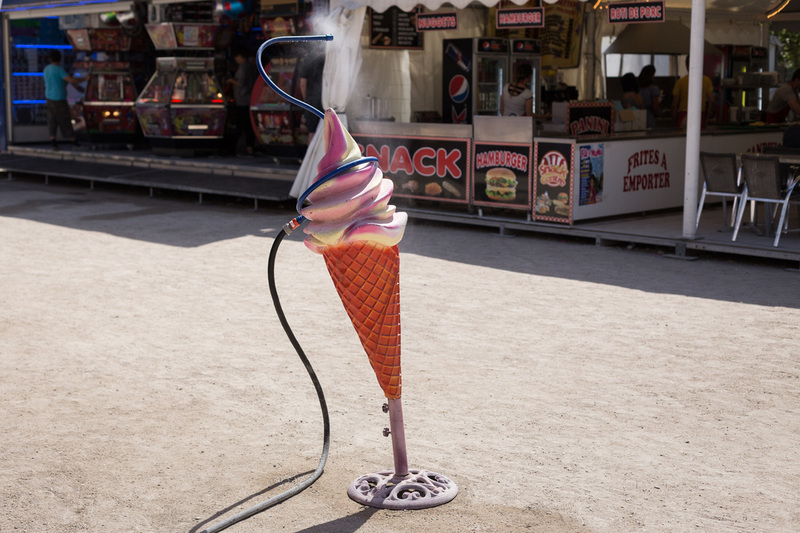 One, it is exactly and only that – a light-hearted collection of photographs of cones, starting in the summer of 2015, through to the time of publishing, spring 2017. 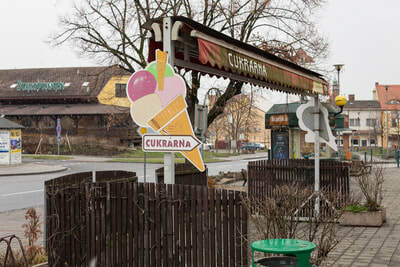 Two, a more personal context - as photographer, I have over the years found a way to explore my surroundings on several levels of awareness, focusing on one or two 'projects' in a conscious way, allowing myself to subconsciously, and more often than not, retrospectively, become aware of that which surrounds me; immediate environment, country, people, and culture. Zmrzlina has become that conscious single thread since my return to Brno, Czech Republic. 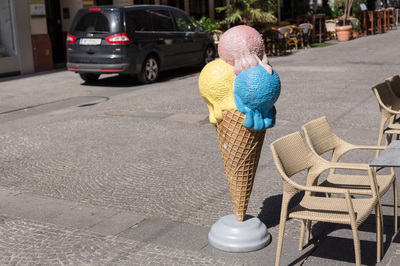 Once identified as a replacement project for the Chinese sofa collection 'Please Sit', a previous subject-specific exploration, Zmrzlina became that basis for me to re-enter the European urban landscape as photographer. 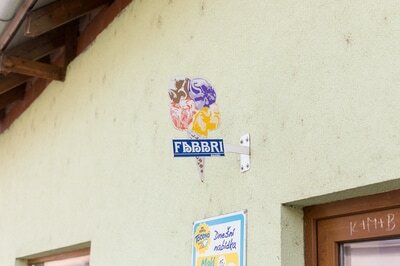 And three. 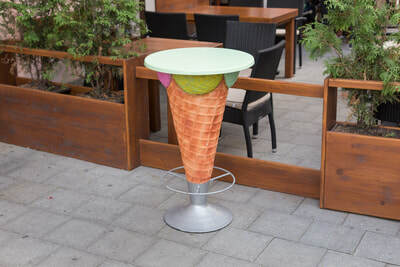 These cones caught my attention specifically because I haven't seen them in China, and I can't remember ever having seen them in South Africa. 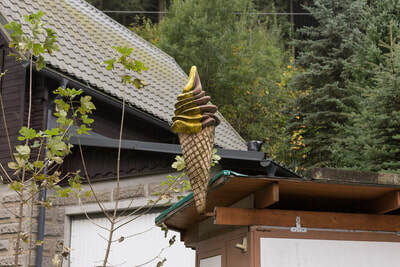 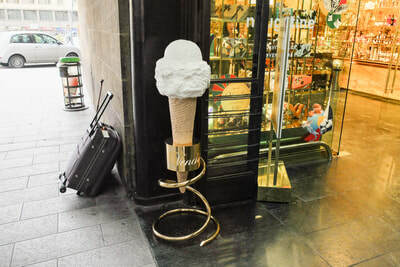 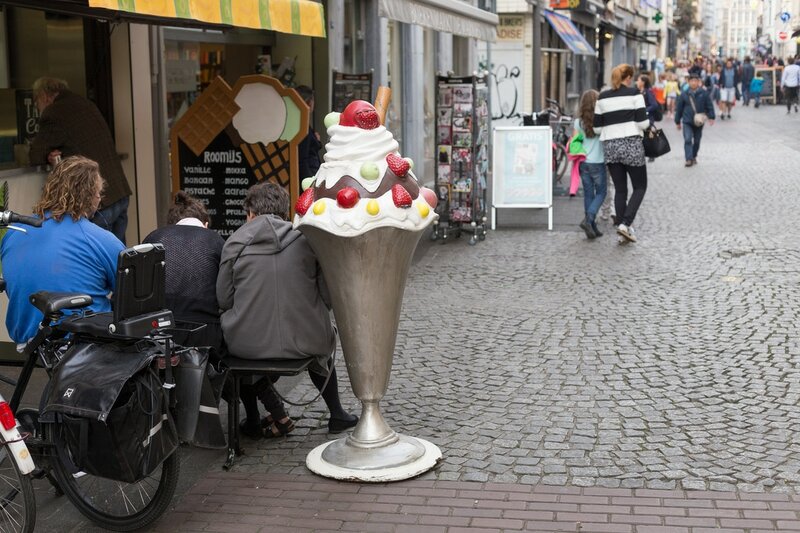 Once the collection started to grow, friends started sending me photos of cones elsewhere in the world, commenting they've never noticed them. 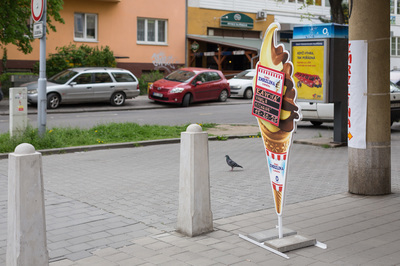 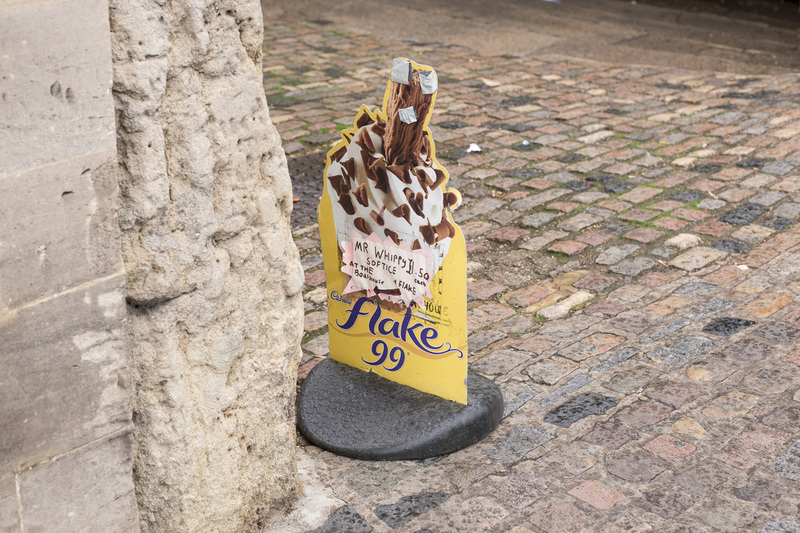 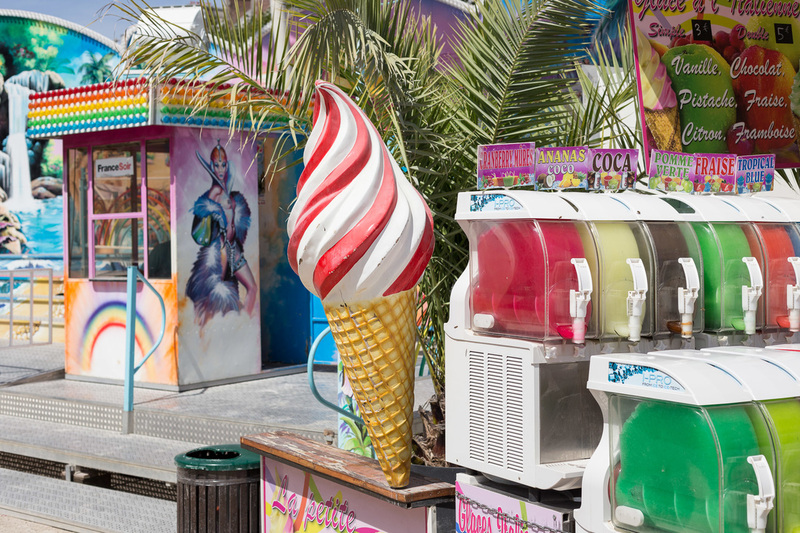 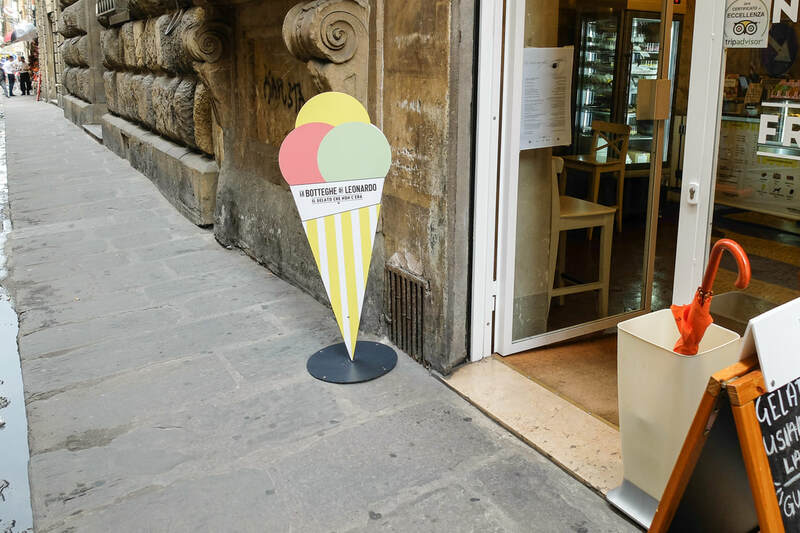 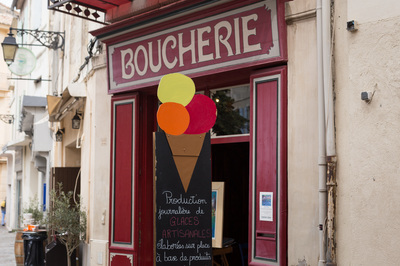 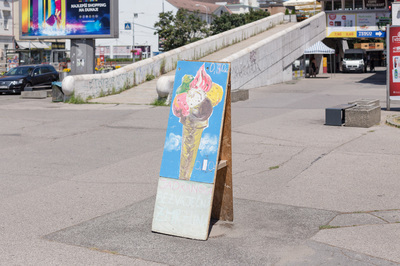 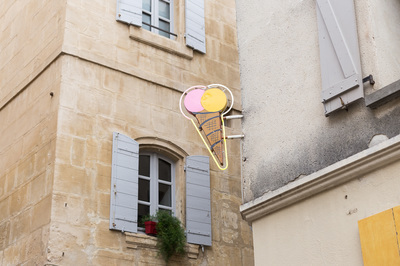 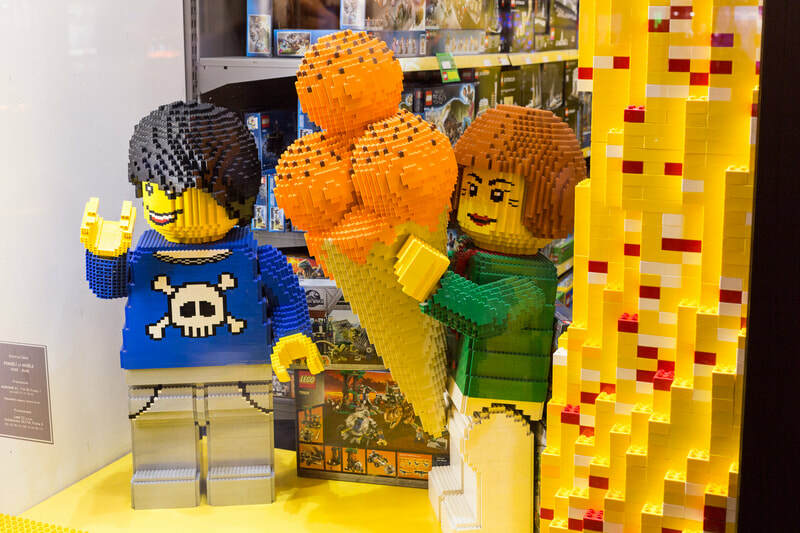 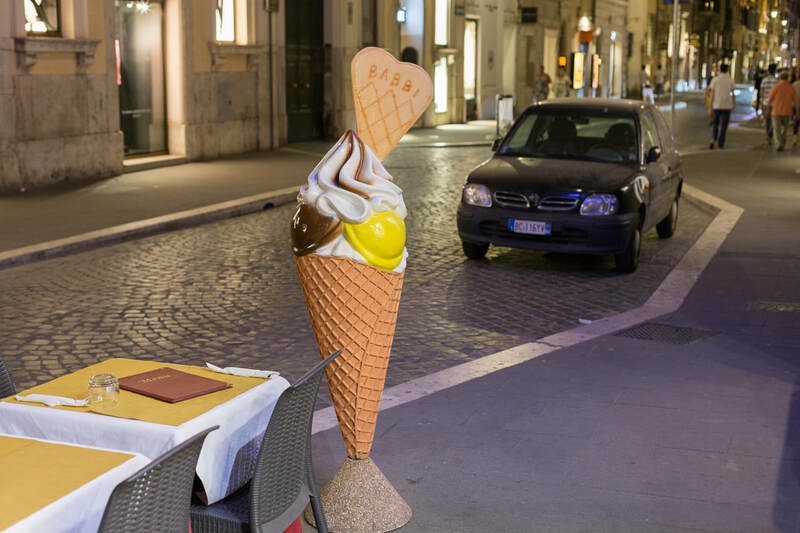 In exactly this becoming-aware-of such an everyday commercial object lies the context of the object itself – the unseen mundane structures of advertising, and it's role in the cultures and countries they appear. 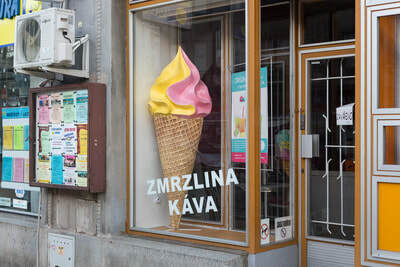 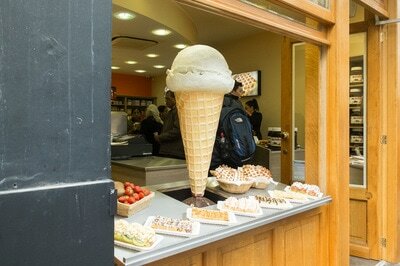 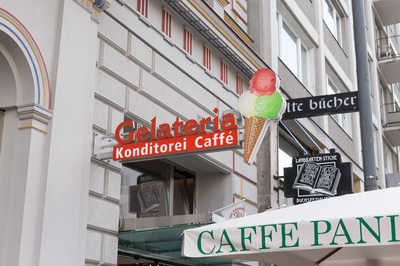 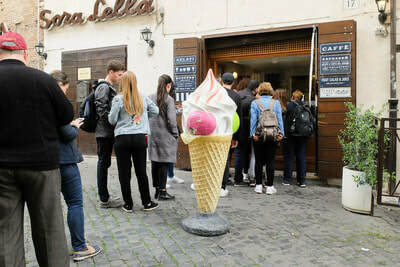 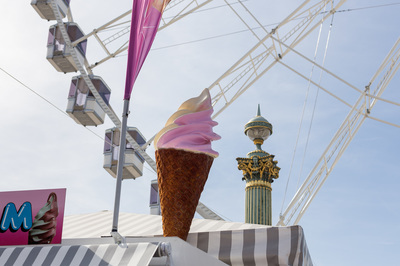 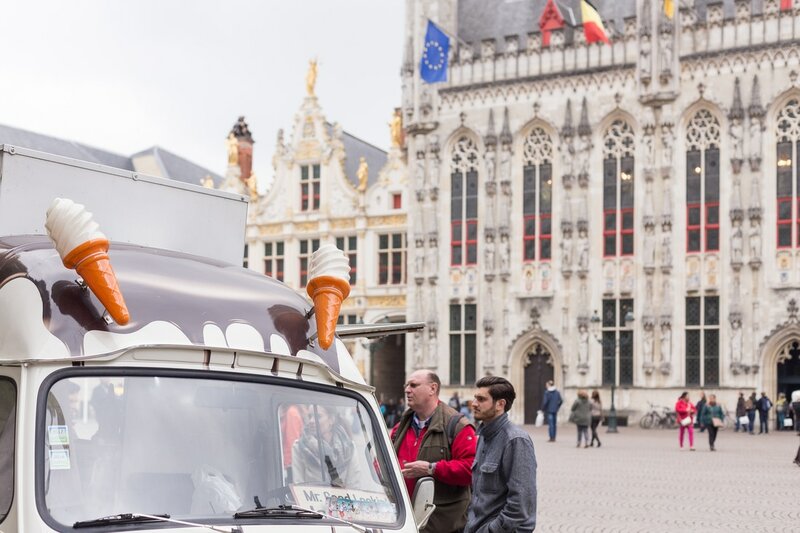 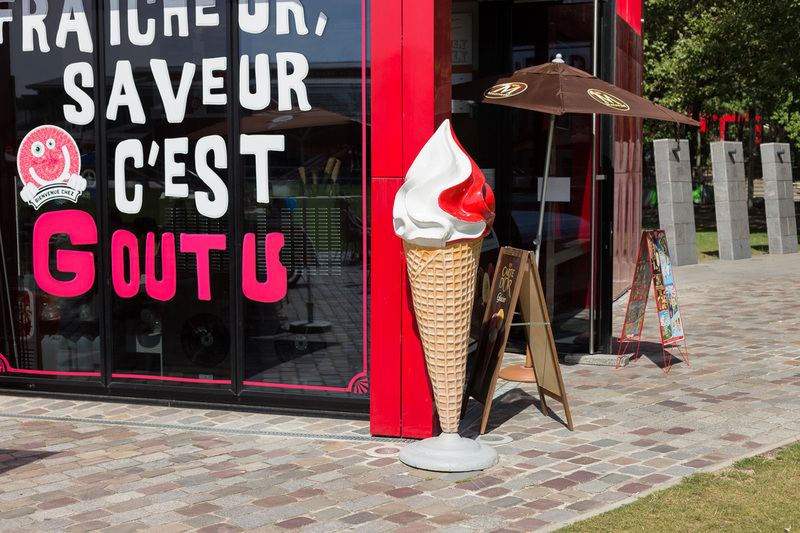 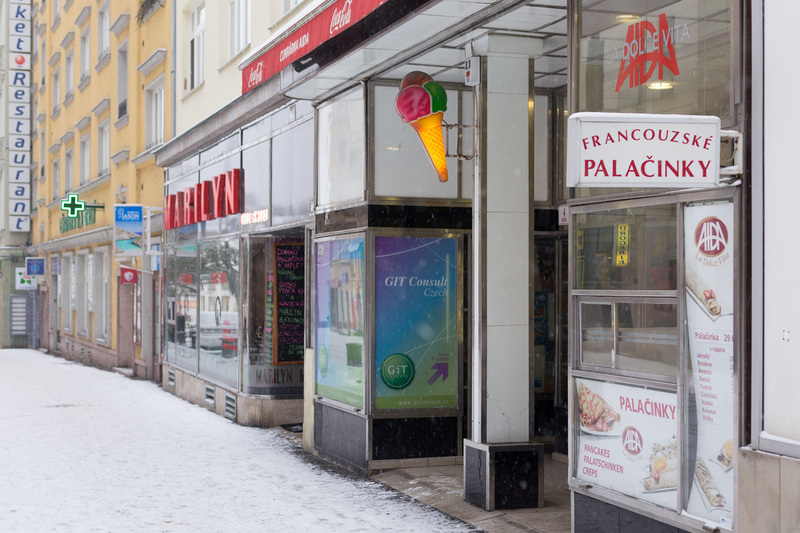 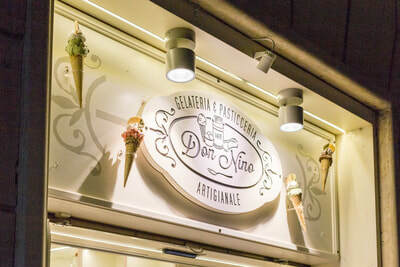 Ever such slight differences can be seen between the cones from different European countries (going by the limited examples I have, anyway) – Polish ones being thinner and tall, Czech cones often depicting soft-serve multi flavoured vanilla and chocolate, German cones being mostly of the scoop kind, and French more often white soft-serve with added flavour lines. 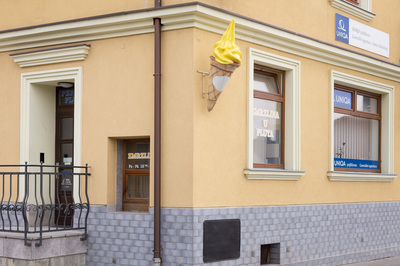 I've been asked more than just a few times why I photograph these cones, and the answer which still seems to be most apt but insufficient is, I'm continuously trying to find differences and similarities between various countries and cultures, and in so, attempting to create a clearer sense of the identity of people, and in turn, maybe also myself.